The novel on this year’s Clarke Award shortlist that stuck out as being most anomalous was Chris Wooding’s Retribution Falls, because it was the kind of exuberant adventure sf which tends not to do well at the Clarke. 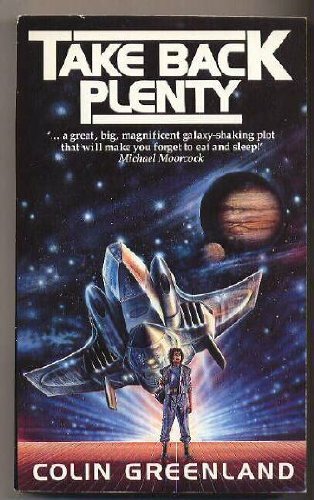 Probably the last time a book of that kind won was back in 1991, when the Clarke went to Take Back Plenty by Colin Greenland, a novel which also has a reputation as being one of the founding texts of the ‘New British Space Opera’ that’s flourished in the past two decades. Quite a weight of expectation, then – but I’m pleased to say that, a few references to ‘tapes’ aside, Take Back Plenty holds up remarkably well today. Partly, I think, this is because the particular twist that Greenland puts on his setting hasn’t (as far as I know) been employed much since; and party it’s because of its sheer brio and sense of fun. Take Back Plenty is set in the future of a different universe, a universe in which there really are canals on Mars and swampy jungles on Venus. Numerous alien species have made themselves known to humanity and populated the Solar System; but no one can leave, thanks to a barrier put in place by the mysterious Capellans. Greenland’s protagonist is Tabitha Jute, pilot of the Alice Liddell, who starts the novel in trouble with the authorities on Mars, and takes on a passenger because she needs the money to pay a fine. But that passenger. Marco Metz, and the other members of his entertainment troupe, may turn out to be more trouble than they’re worth. I doubt it’s any coincidence that Greenland starts the novel during Carnival and names the ship after the girl who inspired Alice’s Adventures in Wonderland, because Take Back Plenty is a parade of incident and colour. Tabitha and colleagues hurtle out of one scrape and into another, but never with a sense of being all-conquering heroes – Tabitha is very much an ordinary, fallible human being; the Alice Liddell gradually falls to bits; and her passengers hinder as much as they help. Yet the rhythm of the story is as it should be: just when you think things can’t get worse, they do; and just when you think there’s no hope, there is. Greenland walks a fine line, but I think he gets the balance just right – Take Back Plenty is self-aware enough to recognise its absurdities, yet it’s also celebratory in its sense of fun, without either being ironic about it or skimping on substance. I love the vivid details in that passage, and the rhythm of the sentences… just great. Take Back Plenty has stood the test of time so far, and I think it will continue to do so. I’d say it’s a worthy winner of the Clarke Award, and it shows just what adventure sf can be. It’s one of my favourite sf novels and I think it belongs in the SF Masterwork series – or, at the very least, back in print. Yes, it’s a great shame that this book has been allowed to slip out of print. Not sure if it was ever a Gollancz title, but it definitely belongs on some sort of masterworks list. Not all of the books published in the SF Masterwork series were originally published by Gollancz. Yes, there are some classic sf novels they’ve been unable to get the rights to, but I wouldn’t jave thought that would be a problem with TBP.